MEMPHIS, TN--(Marketwired - April 21, 2016) - Just the thought of living in a home with mold is enough to strike fear in the minds of most homeowners. Given the health risks and property damage that mold can cause, the experts at ServiceMaster Restore say it is important for homeowners to know how to identify mold on their property, learn where it thrives and understand the best ways to eliminate it from their homes. Today, the company is unveiling the results of its 2016 ServiceMaster Restore Franchisee Mold Remediation Survey, in which more than 250 trained and experienced franchise owners shared their expertise about this dangerous and costly issue that affects homes and businesses across the country. ServiceMaster Restore is one of the largest disaster restoration companies in the United States and a ServiceMaster (NYSE: SERV) company. "Mold isn't something most people think about until they experience it in their own home," says Peter Duncanson, director of system development at ServiceMaster Restore and chairman of the board of directors for The Institute of Inspection, Cleaning and Restoration Certification (IICRC). "It's important to beat mold at its own game -- this means taking steps to prevent mold from growing or calling in an expert right away to stop mold in its tracks once it begins to grow in your home." According to the survey, many people believe they can kill mold on their own using powerful over-the-counter cleaners such as bleach; however, Duncanson says this is not true. "Many retail products will change how mold looks, and you might think it's gone because you don't see it," Duncanson says. "But, the only way to get rid of mold completely and safely -- and to be sure you're protecting your property and health from additional risk -- is to have trained professionals physically remove it from the affected area." According to the EPA1, potential health effects associated with mold include allergic reactions, asthma and other respiratory complaints, as well as irritation to the eyes, skin, nose, throat and lungs. By living with mold, homeowners are exposed to these potential health risks. More than half of ServiceMaster Restore survey respondents said that basements (64 percent) and bathrooms (58 percent) are the rooms where mold is most likely to be present. Common locations vary by region, say respondents, who also noted that in the Midwest and Northeast, mold is found most often in basements, whereas in the South and West, it is found most commonly in bathrooms. Nearly two-fifths (39 percent) say running the exhaust fan during showers is the most effective way to prevent mold in the bathroom. Nearly three-quarters (73 percent) say properly maintaining ventilation throughout the home is paramount in preventing mold growth. The best defenses against mold are to take away its food source, ensure adequate airflow and reduce moisture in the air. Don't rely on retail products, such as bleaches that promise to kill mold, especially on porous surfaces. Vacuum vents every month to remove dust, a primary food source for mold. If you have central heating and air, remember to clean the baseboards, floorboards and bathroom vents, as well. If mold is visible, don't use a consumer vacuum to remove it. This includes wet/dry vacuums, which can actually make a mold issue even worse. If you see mold in an area, do not use a fan to dry things out. Call a professional, as you will likely spread mold spores and create the potential for even more damage. To reduce moisture and control ventilation in the bathroom, run an exhaust fan during a shower or open the door and windows in the bathroom after using it. Consider investing in small household de-humidifiers to reduce moisture. If you have a large home or business, you may need more than one. If you have terrariums and plants, be aware that these can be food sources for mold. Don't ignore the problem. Signs of mold could indicate the presence of larger issues that may cause health risks. If you suspect mold, call a trained professional, like those from ServiceMaster Restore, with the expertise and resources to restore your home to normal and prevent costlier damage. 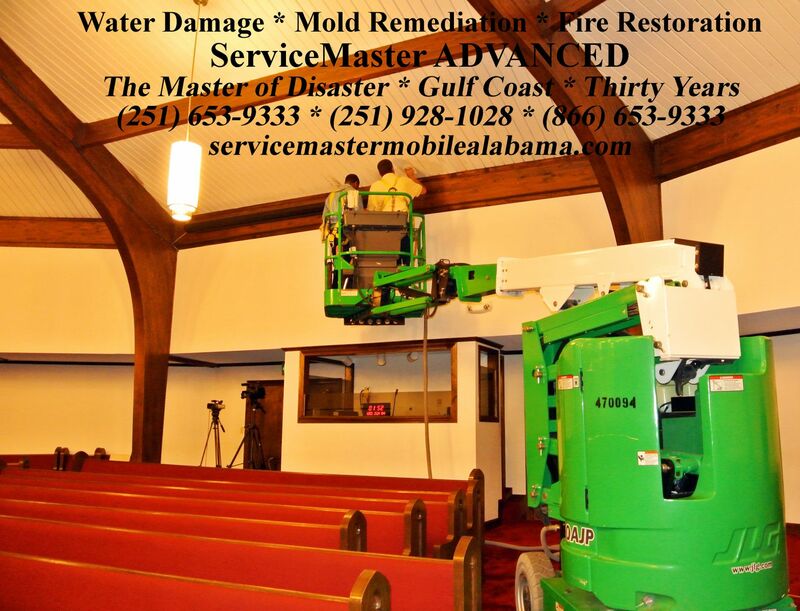 For more expert tips and information about mold prevention and remediation, visit WWW.SERVICEMASTERMOBILEALABAMA.COM For immediate assistance and clean up, call a live ServiceMaster Restore operator 24/7 at (866) 653-9333, or (251) 653-9333. ​ServiceMaster Advanced likely does more mold cleanup project work than anyone in the area. We are certified, and we offer some of the most competitive pricing available. We will be pleased to advise you, if nothing else. Call us if you need answers. 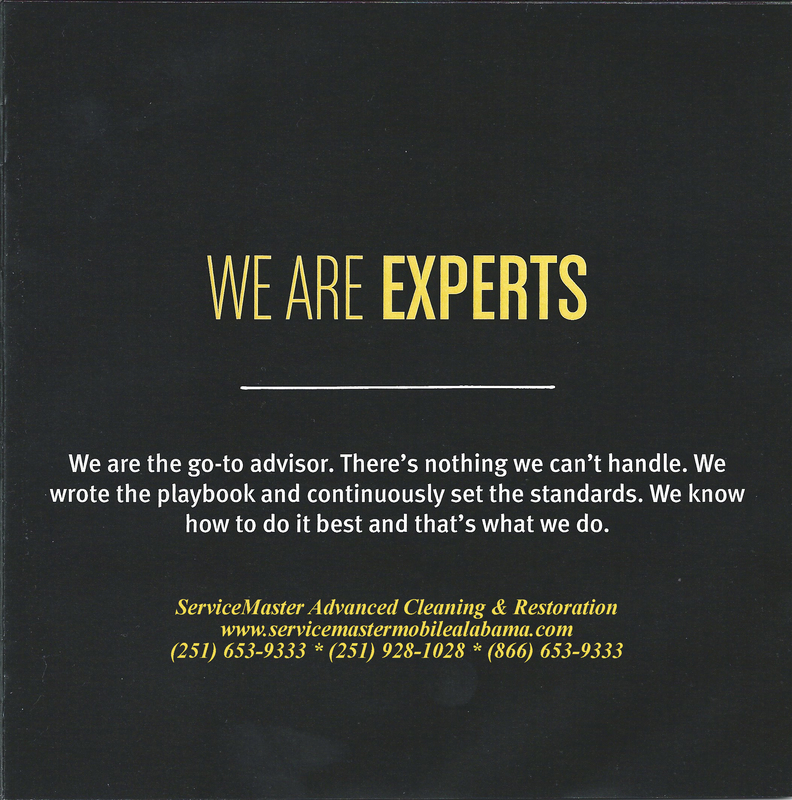 With approximately 1,800 franchised and licensed locations around the world, ServiceMaster Restore and ServiceMaster Recovery Management (SRM) serve customers through a global network of franchises available 24/7/365 to provide residential and commercial restoration services resulting from damage caused by water, fire or smoke. 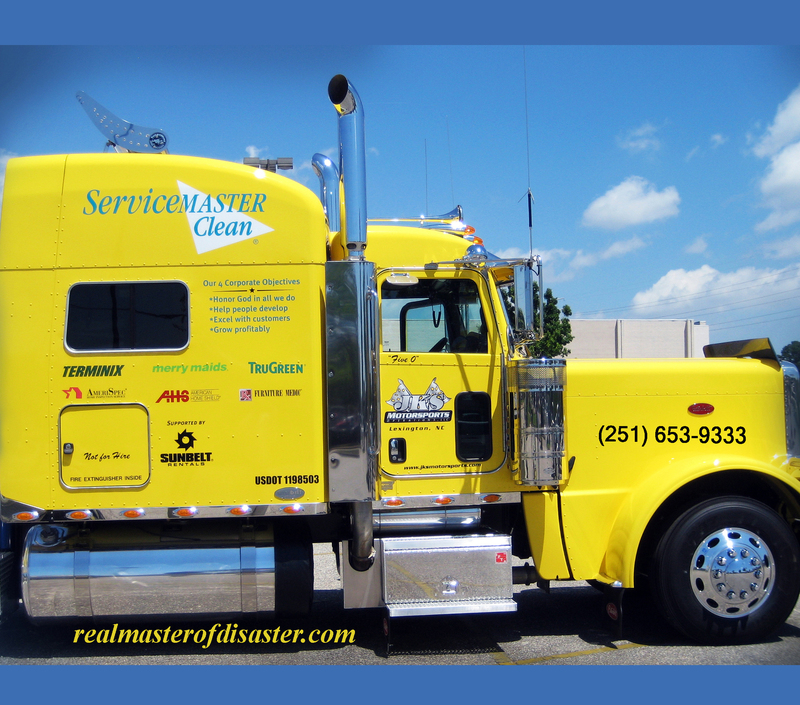 SRM is the large scale commercial catastrophic disaster restoration unit of ServiceMaster Restore. 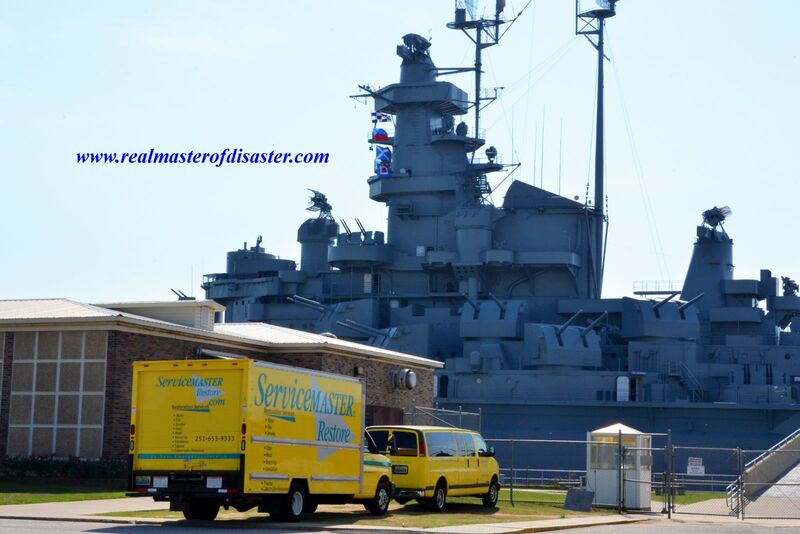 ServiceMaster Restore and SRM have operations and consulting experience on countless disasters, including clean-up after Hurricane Katrina and the Pentagon after September 11, 2001. 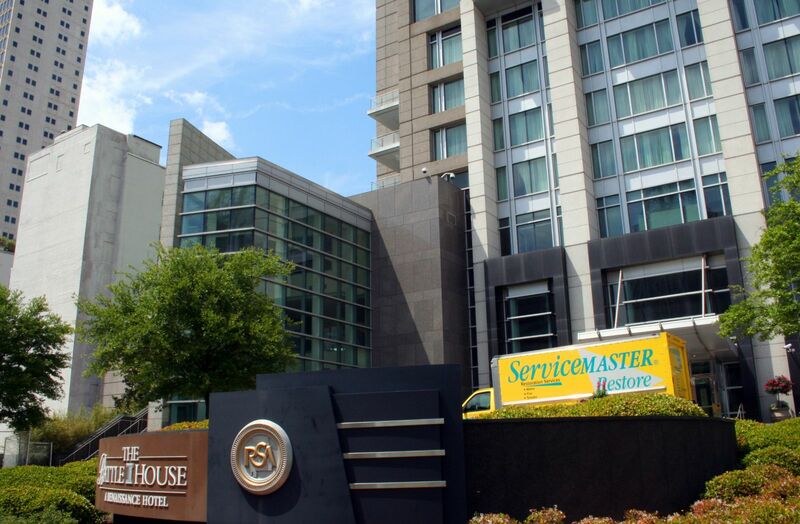 ServiceMaster Restore is a business unit of the Memphis-based ServiceMaster Global Holdings, Inc. (NYSE: SERV), a leading provider of essential residential and commercial services. 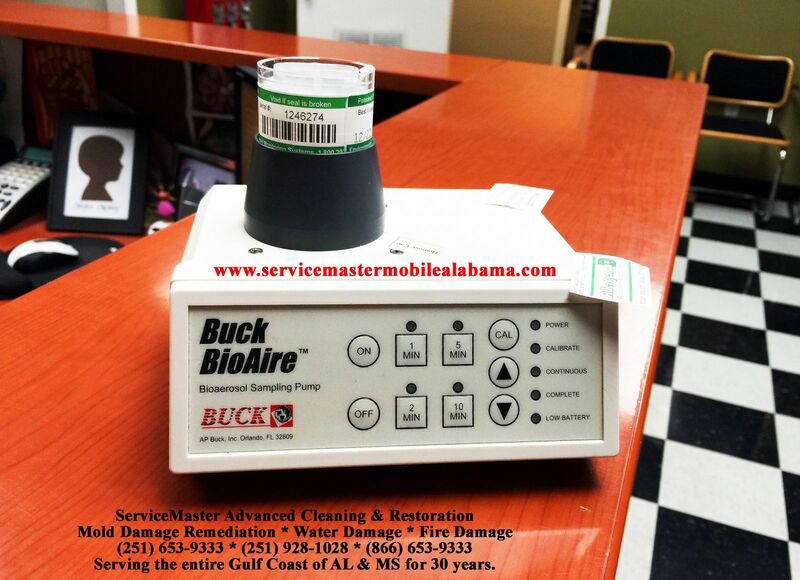 More information can be found at www.servicemasterrestore.com and www.servicemasterrecoverymanagement.com. ServiceMaster (NYSE: SERV) solves the homeowner's dilemma. Every day, we visit more than 75,000 homes and businesses through our extensive service network of expert professionals. Technology powers our trusted experts to engage with customers so they can order, buy and receive services when, where and how they want them. Our well-recognized brands includes American Home Shield (home warranties), AmeriSpec (home inspections), Furniture Medic (furniture repair), Merry Maids (residential cleaning), ServiceMaster Clean (janitorial and residential floor cleaning), ServiceMaster Restore (disaster restoration) and Terminix (termite and pest control). Like, follow or visit us at facebook.com/ServiceMaster, linkedin.com/ServiceMaster, twitter.com/ServiceMaster, or servicemaster.com. The 2016 ServiceMaster Franchisee Mold Remediation Survey presents the findings of an online survey conducted by ServiceMaster from March 11-25, 2016 among a sample of 252 ServiceMaster franchise owners across the country offering mold remediation services for homes or businesses.